Textiles from the Glasgow Japan Exchange of 1878: how a cultural exchange led to an academic one. By Josephine Dear, MLitt Dress and Textile Histories student and Lorna Rowley, 2nd year student, MPhil Textile Conservation. In November 1878 the Japanese government gave to the City of Glasgow a remarkable collection of over 1,000 contemporary art wares. These ranged from architectural pieces, furniture, wood and lacquer ware, musical instruments, ceramics, metalwork, textiles and costume and paper samples. It was exhibited in 1881-2 as part of an Oriental Art Exhibition at the Corporation Galleries (now the McLellan Galleries) in Glasgow, attracting around 30,000 visitors. More recently, in 1992 there was the first total exhibition of the collection, accompanied by the publication of a short catalogue entitled ‘Art for Industry’. Today, Glasgow Museums retain this collection of 1150 items that date to the Meiji period (AD 1868 – 1912) – representing a broad cross section of Japanese fine and everyday arts. The presence of Japanese art wares and design is particularly important in this period when Japan had opened its borders with the west and the Japanese aesthetic became increasingly fashionable and relevant in Britain. This gift was part of an exchange that promoted cultural understanding and awareness between Glasgow and Japan. It was one example of many material exchanges, set up by the Japanese government to promote and improve their industries. In return for this gift Glasgow was asked to send industrial samples to the Tokyo National Museum. Unfortunately today, many of the objects received by Tokyo National Museum from Glasgow cannot be traced, except oil paintings and colour lithographs. It has been suggested by Tokyo National Museum that the industrial samples were likely to have been distributed to relevant institutions at the time or destroyed by the Great Kanto Earthquake of 1923. However, some of the oil paintings did survive as they were lent to the imperial guesthouse. As a student of the MLitt Dress and Textile Histories programme, I have been focusing on the significance of the textile pieces that were included in the government gift for my dissertation. The majority of the textile and costume collection consist of silk fabrics, including crepes, crepe collars and tablecloths. Other textiles include kimono fabric rolls of indigo dyed cotton, stencil printed cotton squares and cotton tabi socks. 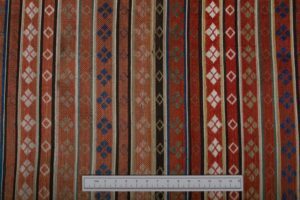 These textile samples are significant as examples of traditional textile manufacture, at point where the textile industry in Japan was beginning to mechanise and adopt western manufacturing technology. Moreover, their context – as objects of a gift exchange – is significant to how they are understood as materials with an added cultural meaning and symbolism attached to them. It is these aspects of the textiles of the 1878 Japanese government gift that I am exploring in my dissertation research, to consider what they communicate and represent about relations between Japan and the West. An unexpected outcome of my research has been my collaboration with Lorna. 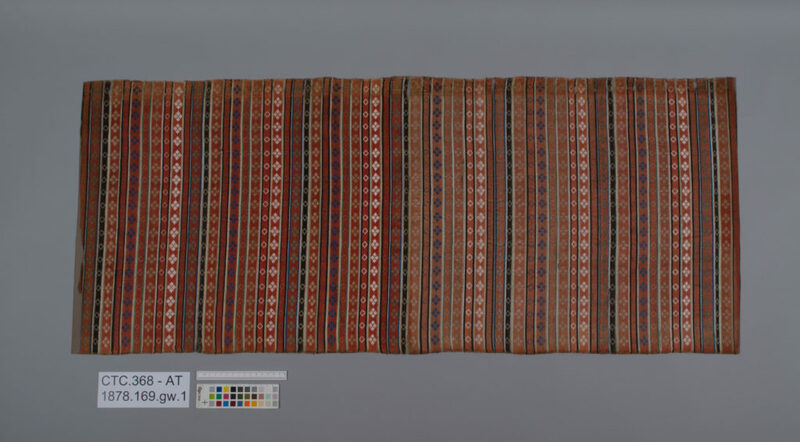 Contributing to the body of knowledge about the textiles from the exchange has provided enhanced context and provenance to the conservation project she has undertaken and as such has highlighted to me the important role of textile history research in the conservation decision making. Fig 1. Before Treatment Overall Front © CSG CIC Glasgow Museums Collection and University of Glasgow, 2017. My final conservation project at the CTC was a single face, woven fragment of silk figured cloth with repeated bands of diamonds measuring 1150 mm (L) x 490 mm (W). The weave structure was made up of 3/1 twill weave ground and features an interwoven continuous supplementary weft. Principal colours include: red, cream, black, green and blue. 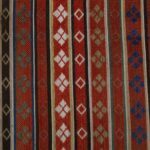 With a thread count of 21 warp threads per 10 mm and 20 weft threads per 10 mm, this textile is characteristic of a high status object. Conservation decision-making is a special area of interest for me. As a profession, conservation conforms to a recognised code of ethics. Rationale such as stability, damage or aesthetics are common considerations regarding the treatment of previous repairs but these have to be balanced against ethical considerations about their evidential value. Fig 2 Detail of the paper _front ©CSG CIC Glasgow Museums Collection and University of Glasgow, 2017. In this case, the fragments of paper at the edge of the fabric were causing a visible deterioration of the object. Paper is acidic, releasing volatile organic acids over time, which in this object was accelerating the silk fibre degradation. However, the unknown origin and function of the object required further investigation to determine the historical significance of the paper before any conservation proposal to remove it could be justifiable. It was here that both the existing curatorial information about the object and the research undertaken by Josephine became invaluable. 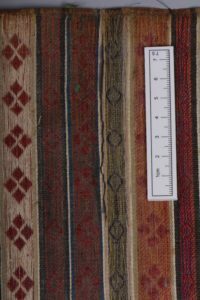 It informed me that the textile was from the 1878 Glasgow Japanese Exchange and was a length of fabric which would have originally used for the decorative fabric (‘tatami-beri’) binding the edges of traditional Japanese rush floor ‘tatami’ mats. Fig 3 Detail. Fracture ©CSG CIC Glasgow Museums Collection and University of Glasgow, 2017. Fig 4 Detail. Light damage ©CSG CIC Glasgow Museums Collection and University of Glasgow, 2017. 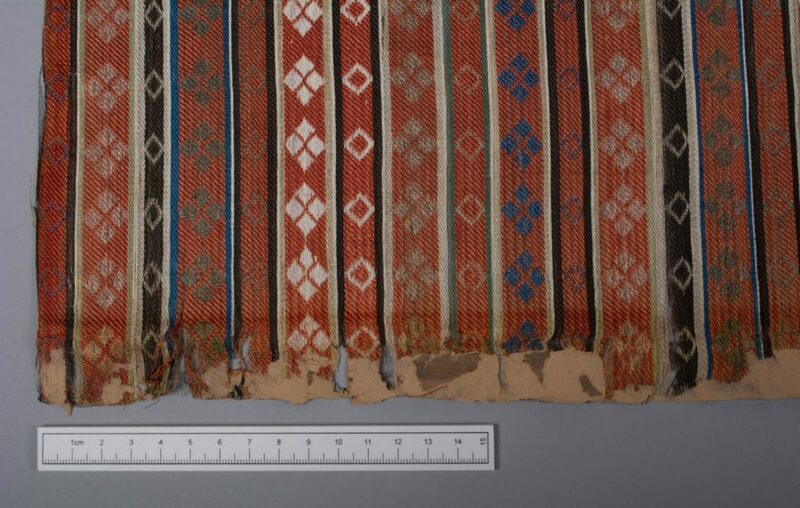 The textile was fragile, embrittled and was at risk if handled. Due to the fact that the textile was woven with a natural silk warp and a processed (i.e. dyed) weft, the textile fragment is inherently stronger along the direction of the weft threads, this is typical of Japanese silk weaving of this period. The front face was considerably faded likely as the result of past exposure to humidity and light. There was marked discolouration along the bottom edge of the fabric. Creasing patterns suggested that the fabric was once folded in half (possibly for display). 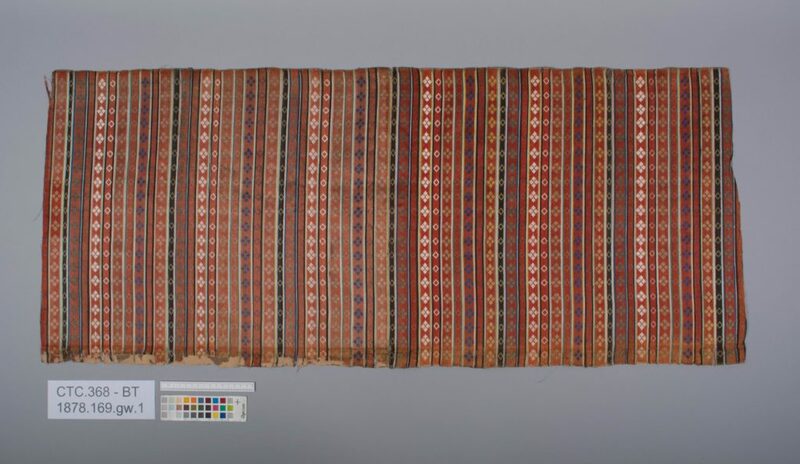 Following consultation with a paper conservator, the paper fragments were identified as being of Western origin and that the fabric underneath it was also discoloured suggested that it was not original to the object. This view was supported by the provenance information and suggested the fragments of paper were likely to be the remnants of a previous mounting mechanism. Following consultation with conservators and the curator at Glasgow Museums, the decision was made to remove the paper fragments. The paper fragments were softened using ultrasonic humidification and removed mechanically. Animal glue adhesive residues were also reduced. Post treatment, the condition of the textile is much improved. The fragment was surface cleaned and, following humidification, it is less brittle. The visually obtrusive paper fragments have been removed, terminating any further release of volatile organic acids. The textile was fully supported using a conservation grade adhesive cast silk crepeline and supplementary stitching. This project presented a complex set of conservation problems. It has been a fulfilling way to advance my understanding of both the conservation decision–making process and has also broadened my knowledge of Japanese culture. Understanding the original function of the object explained its inclusion in the gift of art-wares from Japan, informed the assessment of the paper fragments and underpinned the conservation treatment. But most importantly, the project has highlighted the fundamental value of all types of knowledge exchange – cultural, academic and professional. Fig 5: After treatment©CSG CIC Glasgow Museums Collection and University of Glasgow, 2017. Olive Checkland, Japan and Britain after 1859: Creating Cultural Bridges (London: Routledge, 2003), 135-136. Antonia Lovelace, ‘Art for Industry: The Glasgow Japan Exchange of 1878, UK, Glasgow Museum Publishing, 1991. Gerhard Banik and Irene Brückle, Paper and Water: A guide for conservators, (Oxford: Elsevier, 2011) 222. Sato Osamu, “A History of Tatami,” in Chanoyu Quarterly no. 77 (1994): 7 – 27. Banik, Gerhard and Irene Brückle. Paper and Water: A guide for conservators, Oxford: Elsevier, 2011. Checkland, Olive. Japan and Britain after 1859: Creating Cultural Bridges, London: Routledge, 2003. Lovelace, Antonia. ‘Art for Industry: The Glasgow Japan Exchange of 1878, UK, Glasgow Museum Publishing, 1991. Osamu, Sato. “A History of Tatami,” in Chanoyu Quarterly no. 77 (1994): 7 – 27. Jean Portell, 2003. Prior repairs: when should they be preserved? Journal of the American Institute for Conservation 42: 363 – 80. Yanagi, Yoshikuni, Yoshiyuki Kondo, and Kiyoshi Hirabayashi. “Structure and deterioration of silk fabrics of the edo period.” The Journal of Sericultural Science of Japan 69 no. 2 (2000): 105 – 109. Very interesting piece. There’s one typo, however – it should be “Principal colours”. Thanks for your comment – and for spotting the typo!